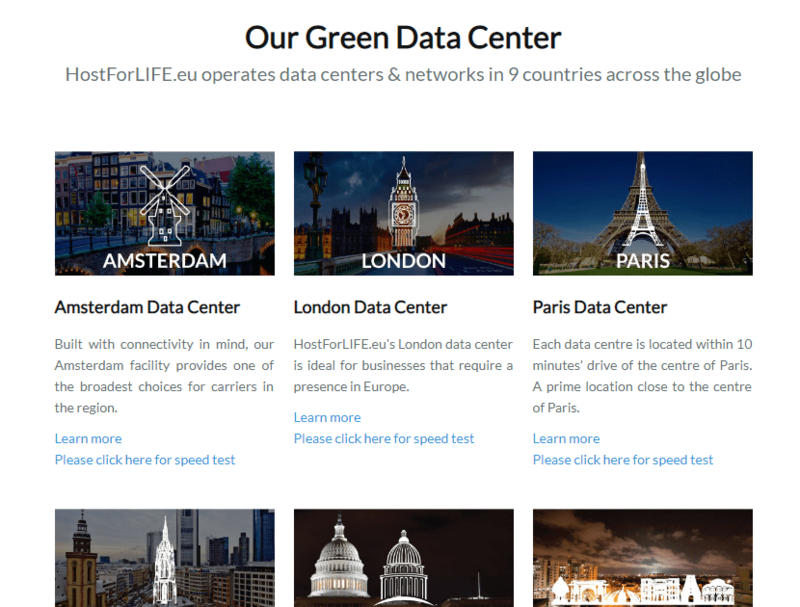 HostForLife.eu Review 2019: Is HostForLife.eu a Good Hosting? An excellent hosting service with great prices, HostForLIFE is a good choice for anyone looking for a reliable and stable hosting partner to support their growth. HostForLIFE is without doubt Europe’s best and most trusted Windows hosting service. With reliable servers in four major European cities and nine other cities around the world, HostForLIFE brings businesses closer to their customers. HostForLIFE wholly owns all their servers and network equipment, unlike many hosting services that rely on colocation. This is why HostForLIFE can promise you a 99.99% uptime SLA even for basic services. This basic plan is best for small, personal sites. If you need more MSSQL databases, SQL server space, or email storage, you can opt for their higher-tier plans. Alternatively, their Windows cloud hosting packages are also excellent choices, though these have limitations on storage and bandwidth. The advantage of these cloud hosting plans is that they’re easily scalable at any time. With HostForLIFE, you get a dual-quad core server with at least 16 GB RAM and RAID 10 disk arrays. From my experience, set up is easy: your servers will be up and running within an hour of placing your order. Customers concerned about data security will be happy to know that HostForLIFE takes server security and data protection seriously. They have a foolproof security system that monitors their network constantly for unusual activity and alerts technical support to take action before the issue affects your servers. But HostForLIFE doesn’t just give you all the best tools to manage your web space — they also offer you a superb environment in which to operate. Thanks to their powerful and intuitive Plesk control panel, you can take charge of your business websites, emails, databases, domains, and add-ons such as dedicated SSL, scheduled tasks, static IPs, FTP and user accounts. While their Windows plans are their most robust offerings, HostForLIFE also does have an array of Linux shared hosting packages and dedicated servers available. Even their most basic Linux shared hosting plans start you off with unlimited domains, unlimited storage, unlimited bandwidth, and unlimited subdomains – which is pretty impressive. HostForLIFE’s plans are designed to give you maximum value. Frankly, the first time I saw their plans, I thought they were a bit expensive. But as I took a closer look, I realized that their plans include a ton of features. HostForLIFE offers flexible web hosting contracts. They won’t force you to commit to a long-term contract like other web hosts. You can choose any of their four hosting cycles: quarterly, semi-annually, yearly, or a two- to three-year cycle. They also offer a 30-day money back guarantee. HostForLIFE also doesn’t penalize you for switching plans. You can switch tiers at no additional charge if your website has outgrown your current hosting plan. If you’re stuck on which plan would be best for your needs, their support team is always on standby to advise you. HostForLIFE has a large army of highly-qualified technicians, managers, and network engineers who are available 24/7 on live chat, email, and via a ticketing system. Whether you have pre-sales questions or want to report server problems, you’re assured of timely responses. HostForLIFE offers the best-in-class Windows hosting in Europe with fantastic uptime, robust security, and terrific technical support 365 days a year. Wondering how HostForLife.eu stacks up against other Web Hosting companies? Enter any other Web Hosting company and we will give you a side-by-side comparison.